At the beginning of the summer I had the blessed opportunity to teach a 3 day watercolor painting workshop for the Yates County Arts Center at their Sunny Point cottage. 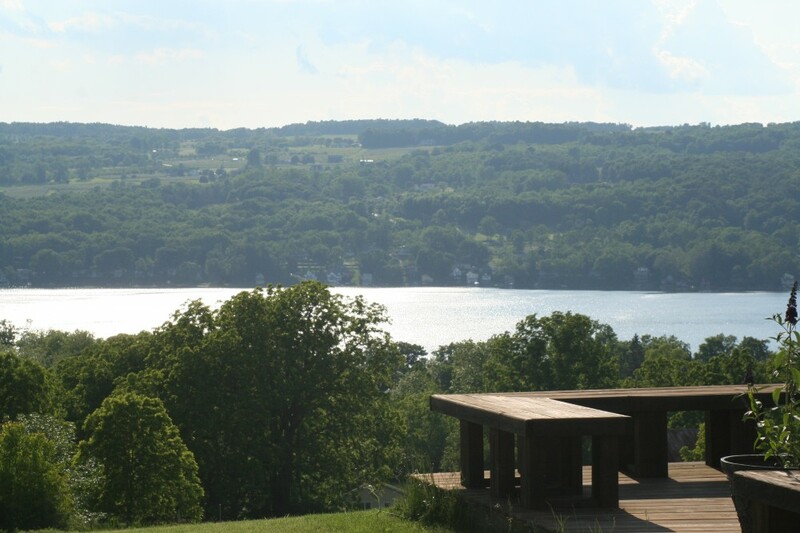 Sunny Point is a cozy cottage with an incredible barn shaped like a lighthouse at the edge of the water on Keuka Lake in the beautiful Finger Lakes of upstate NY, the lake is surrounded by endless first class wineries! Backyard or front? Either way it’s breathtaking, imagine having your morning coffee here! At the time of the workshop I was recovering from a fracture on my left leg, the cast had been removed and replaced with one of those Frankenstein braces, this made it a little difficult to get around. My 9 year old daughter, Rebecca, was ending the school year and her classes were winding down, coupled along with my husbands working schedule we agreed that it would a good idea to bring her with me, she was in heaven! She turned out to be the best Assistant and student, we had a wonderful time together and the workshop participants pampered her, who wouldn’t enjoy that? This was a workshop jam-packed with lots of information, demonstrations, painting and hands-on exercises. I’m a tough teacher, I worked them pretty hard, at the end of the 3 days they needed a nap and so did I! I do admit I go overboard with information and I try to be extremely organized. Since I was providing so much information I wanted to make sure they had plenty of painting time, again that’s why they are there. I prepared and printed notes for the participants and then bounded them with a binding machine I had purchased, they turned out to be quite handy for the students, they didn’t need to take tons of notes and can refer to them later. Perhaps I overwhelmed them with too much material for a 3 day workshop, but all in all I believe for some they learned something new, for others some material was a refresher or perhaps they saw it with a different perspective. Adjust to all skill levels; I put myself in their shoes and remembered when I went to my first workshop and felt so unsecured as a beginner. I’m sensitive to their needs, I make sure these participants get the most as they are moldable and need a little extra attention without neglecting the intermediate and advanced painters. I try to encourage a warm and inviting atmosphere among the participants to encourage participation. I was quite surprised with the number of students who made copies of information for everyone, shared a book or a great tip. I do try to maintain control of the time and conversation, I respect the fact that students are there to paint and learn, their time is valuable, without them I wouldn’t be teaching the class. I learned tips from students as we went along that I can apply for future classes and in my art work. I encourage feedback, yes I had them complete a questionnaire, it’s priceless and I respect all feedback: the good, the ugly and the in between. Feedback is the way to feed forward. I learned that I love to share my joy of art and painting and that I wasn’t alone! Thanks to everyone who made this a special time and place for Rebecca and me, for the wonderful gifts showered upon us in material and spirit. Thank you Dr. Annie Smith for gracing us with incredible inspiration for our art and souls. Thank you to Ampersand Art Supplies for the samples for the students to mount their watercolors. Thank you to the Yates County Arts Center that in addition to teaching, invited me as one of the three featured artists for their exhibit “Thyme In A Garden” which ran concurrently with the workshop, how cool is that, they are just terrific! They have a great new building on Main Street and are offering all types of classes in their new HUGE classroom, watch their website for upcoming classes. Thank you Rebecca for being there for mom, I’m truly blessed to have you as a daughter! Above all, thank you to all the participants who shared this magnificent experience with me! We hope to return to Sunny Point in the future! get anything to “flow”. Live and learn. Music to my ears, thank you Bonnie! Bonnie is a very talented artist, tons of experience, we found we had many books in common. What Bonnie is referring to is the extremely smooth surface of Claybord, comparable to Yupo or Hot Press paper. For a comparable paper to cold press paper, I would recommend the Aquabord. Here is “Exhuberance”, which was part of the exhibit “Thyme in a Garden”, painted directly on Aquabord, it measures 36×24″, larger than a full sheet. I had it framed with a linen fabric and wood frame, looks lovely, I love this piece. To achieve the dark background I used acrylic paint, the tulips were painted with watercolor. It has a plexiglass to protect from dust, another option is to varnish the surface. I really love these products because it save me money on framing, specially when I mount the watercolors on to the Claybords, the surfaces are acid-free, and with the large selection and variety of sizes and panels I can get very creative because I’m not limited to one option of framing, size or medium… yes, to creativity! I have seen a large number of artists using these products in many creative ways, techniques and mediums, it’s fascinating to see new art! I want to share with you a few of the pictures from the workshop. You’ll see the participants doing building exercises: color blending, color intensity exercises, glazing techniques and mounting their their second watercolor painting onto an 8×10″, Ampersand Claybord, thanks to the genorosity of Ampersand Art Supplies! What are your teaching or workshop experience(s) that have inspired your style or changed your skills? Some artists have a very difficult time parting from their artwork, limiting their visibility for the world to enjoy to appreciate their skills and hard work. I’m thrilled when one of my creations finds a new loving home, it goes beyond the monetary transaction, it reflects acceptance from a collector that they enjoy it as much as I enjoyed creating the piece. 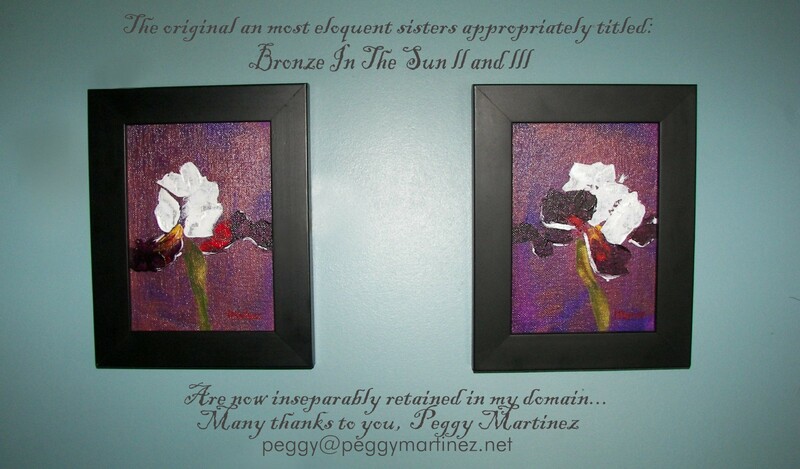 This week I sold a pair of 5×7″ framed acrylic paintings via my Etsy shop, La Galeria, these were created using a textured impasto technique with metallic bronze in the background. I was surprised when I received this image via my Artist page on Facebook from the buyer! It saids it all…thank you Louis! You can also follow me on Facebook for updates and events, click here to access my Facebook page! More media: Chosen as “Woman to Watch”! I’m thrilled to be in todays’ Democrat and Chronicle under “Her Rochester” were I was chosen as “Woman to Watch”! Great piece, thank you Annette and Michelle for the opportunity to share my vision for Asthma Awareness and my beautiful art! When Peggy Martinez, 51, of Chili, decided to leave her 29-year career in banking to pursue artistic dreams, she had two goals in mind: to present a solo exhibit and to have her art published in American Art Collector Magazine. “It’s like Sports Illustrated for artists,” says Martinez, who accomplished her goals in two years with no previous background in the art world. In May, an oil painting of a yellow rose and bud titled Tenderness, was featured in American Art Collector. Then, she led her first solo exhibit at the 1570 Gallery on East Avenue. The exhibit, called “Gift of the Rose,” debuted in June and ran through Aug. 24. She also wanted to honor her sister, Margarita ‘Margie’ Martinez, who died at age 33 from complications of chronic asthma, leaving two young children behind, now 20 and 26. 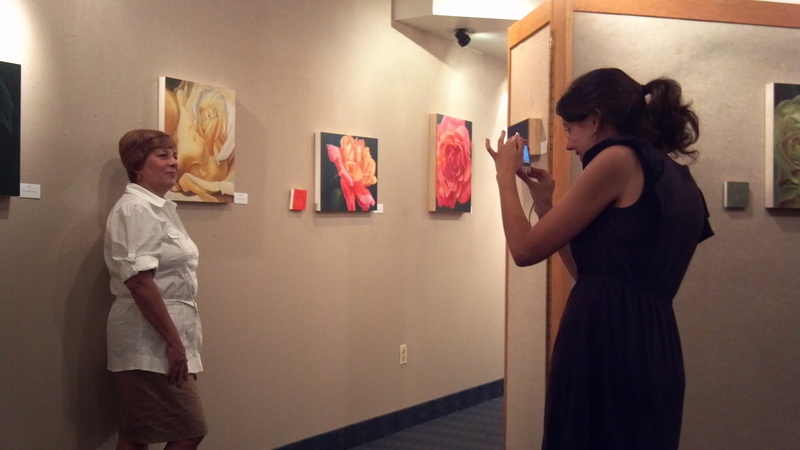 Drawing inspiration from a photograph of Margie surrounded by roses, Martinez decided to focus on rose varieties for her exhibit, and collaborated with Golisano Children’s Hospital to benefit pediatric asthma support. “One in 10 preschool children will be diagnosed with asthma,” says Martinez, who notes that about 3 million Hispanics in the United States have asthma. Of these, the majority are Puerto Rican, and many members of the artist’s family are affected, including her 9-year-old daughter, Rebecca. She also plans to publish a book of prints from the exhibit alongside stories and poems from the community about the meaning of the rose. She is still seeking submissions and plans to donate all proceeds. To view artwork or submit a story, go to giftoftherose.com. Martinez has also been commissioned by Latinas Unidas to create a painting in honor of the group’s Reconocimiento Awards, which recognize local Latina women. The painting will be unveiled at the awards luncheon on Nov. 2. and a limited number of prints will be available for sale. Personal: Age 51, of Chili, married with three daughters (Francesca, 28; Jasmine, 25; Rebecca, 9), and one grandson, Xavier, 7. Community activities: I support Latinas Unidas, they live up to their mission of empowering Latinas; they are my sisters that have supported me through the ups and downs. My favorite thing to do in Rochester: Visit and paint local gardens. Biggest challenge I’ve overcome and how I did it: Learning how to maneuver through computers. … I challenged myself to learn the most I can, I’ve come a very long way including creating a website, a blog, and I love social media! One thing I’ve always wanted to do but never have: Paint in Tuscany. If I could change one thing about myself it would be: Stay focused! I have a creative mind and it doesn’t stop. The talent I would most like to have: Be a great writer. The one thing I can’t live without: Coffee and art supplies. My favorite movie: Dances with Wolves.